Adolph Neaderland, left, speaks to the Planning Commission at Tuesday’s public hearing in City Hall. Neaderland said Saturday that he was not speaking for the Coalition of Norwalk Neighborhood Associations or for the Norwalk Association of Silvermine Homeowners. NORWALK, Conn. – The “optimal size for a city like Norwalk” is one of many questions residents have regarding a plan which could guide the city’s development for the next decade. Walkability, the “rusted hulk of an abandoned outlet” that is the Manresa Island former powerplant and the desire for a bookstore were also mentioned by citizens last week at the last Planning Commission public hearing on the drafted 10-year city-wide master plan, otherwise known as the Plan of Conservation and Development (POCD). Norwalk has been working on a new master plan for more than a year, with the effort now reaching the point where Norwalk’s volunteer leaders – appointed and elected officials – can scrutinize, tweak or revise the work that’s been turned in by the City’s consultant, Stantec, in response to public input at a series of meetings. There’s still time for you to weigh in, as the public comment period goes through Thursday. Visit http://stantec.civicomment.org/norwalk-citywide-plan to view the plan and/or leave comments. “I expect the Planning Commission will review all comments in the next month or so and see where we are,” Planning Commission Chairwoman Fran DiMeglio wrote in a Wednesday email to NancyOnNorwalk. A comment left on Stantec’s interactive draft review plan website. Neaderland helped guide the POCD effort as a representative of the Coalition of Norwalk Neighborhood Associations (CNNA) on the POCD Oversight Committee. At Tuesday’s public hearing, he said he had read the entire “483 pages” and had concerns about the process. 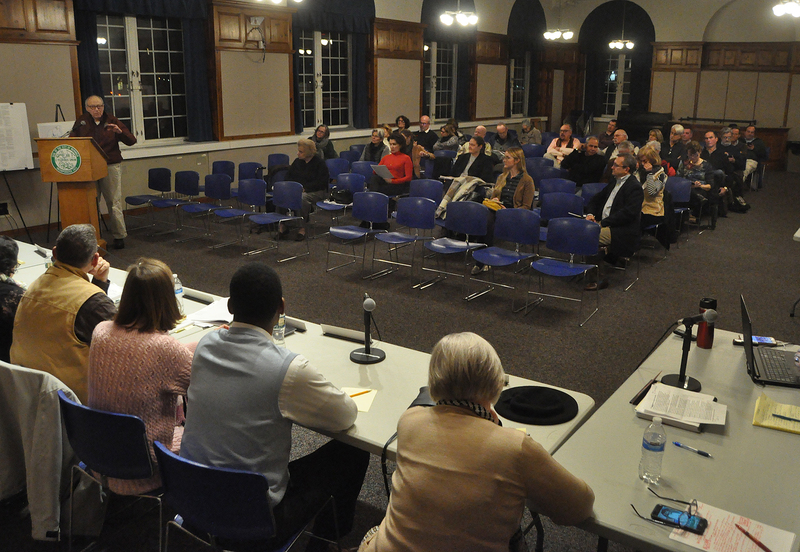 “We as a group, you folks, myself as a member of NASH (Norwalk Association of Silvermine Homeowners) and CNNA, have done a lousy job of outreach,” he said, lamenting that there wasn’t even 1 percent of the population at the meeting. “The biggest potential for major improvement is Manresa,” former Conservation Commissioner Bill Nightingale said Tuesday, noting that it’s not in the plan. It is, Planning Commissioners said. Planning Commissioner Nora King said something is being done. “We had a really great meeting,” regarding the site, King said, with talk of a marine university or a combination of a marina and solar farms. The power plant was built in 1955; NRG Energy Inc. bought it from Connecticut Light & Power (CL&P) in 1999, and Norwalk in 2016 invested $75,000 to help the Manresa Association pay for a study of options for the 124-acre property, of which about 45 acres contain coal ash. “The final report/recommendations from the Economic Impact Analysis (EIA) will be published in the next few days. 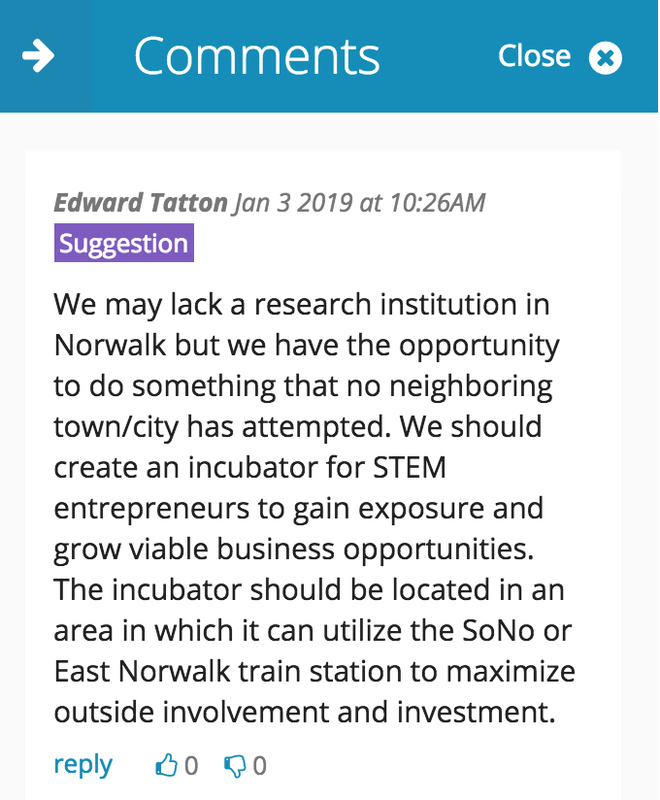 As you’ll recall, the EIA was funded and overseen by a public/private partnership of the City of Norwalk and the Manresa Association,” Manresa Association President Charlie Taney wrote to NancyOnNorwalk on Friday, regarding the meeting King mentioned. “NRG participated in the series of public workshops held to inform the public on the plan’s progress and to seek public input,” he added. A bookstore? One you can walk to? Norwalk needs a bookstore, several people said. Bradley Craighead, leader of the Norwalk Green Association, remarked that he had posted that sentiment on Facebook two weeks ago and “people were all over” the idea of a Wall Street bookstore. “We all love bookstores. However, we can’t force companies to come and do bookstores,” King replied. The plan emphasizes the possibility of bringing a higher education element to Central Norwalk, she said. “I think this plan reflects that,” King replied. “A plan for the next generation should be more than aspirational. Such a plan should help and guide the decisions,” CNNA Provisional Executive Committee Chairwoman Donna Smirniotopoulos said, reading a statement she said was approved by eight neighborhood associations. Neighborhood associations send representatives to CNNA, and CNNA voted to approve the statement, NASH President Heather Dunn said. “We strongly object to the formation of a new and independent utility and to any additional tax burden on property owners based on contribution to stormwater,” the CNNA statement reads. “The POCD provides a host of information and suggestions, all of which should be carefully considered. I’m sure you’ve seen in the POCD the mention of New London’s stormwater utility. Here is a link to their page: http://ci.new-london.ct.us/content/7429/7431/7459/18132.aspx. “It is the consensus of our membership that the fine tuning currently planned is insufficient,” the CNNA statement reads. “As such, we would appreciate a special one-on-one meeting with the Council, Stantec and the Planning Commission to exchange views and to cover the following issues in open dialogue.” The full statement from CNNA is here. “Thank you for including Norwalk Public Schools in the POCD, which is a first,” Board of Education Chairman Mike Barbis said. Barbis promised that Norwalk Superintendent of Schools Steven Adamowski would submit comments. “Please, let’s make this POCD fulfill that role for the city because the city as far as I am concerned, as a private individual as well as chairman of the Board of Ed, does not have a plan,” Barbis said. Sandy Schmitt said she and her family moved to Norwalk from Long Island after looking around and deciding on “beautiful funky” South Norwalk. “Norwalk is becoming a little Manhattan, we don’t like that,” she said. “What is our goal? Where do we want to be?” Bill Nightingale asked, asking when Norwalk would have to build a new sewage treatment system with all the development that is underway and envisioned. Norwalk’s wastewater treatment plant can handle 18 million gallons a day and typically process 13 million gallons, the master plan says. Nightingale asked how that compares to other towns. The Rev. John Cardamone said the 2008 plan suggested that the waterfront shouldn’t be walled off but the view he used to enjoy while driving down Sunset Hill is gone. “I would have eminent domain and take over all the coastline. I don’t believe in building on the coast line,” he said. Goldstein applauded. Mike McGuire said the plan does a good job in recommending a Wall Street train station, but slammed the Norwalk Redevelopment Agency. Thank you former Council member Rich Bonenfant, “…The taxpayers are kind of getting fed up with watching thousands of units going up.” I certainly am fed up and we need some common sense on the council not the mayor’s puppets we have now. We also need our zoning completely overhauled so overcrowding and no thought development is not allowed to continue. 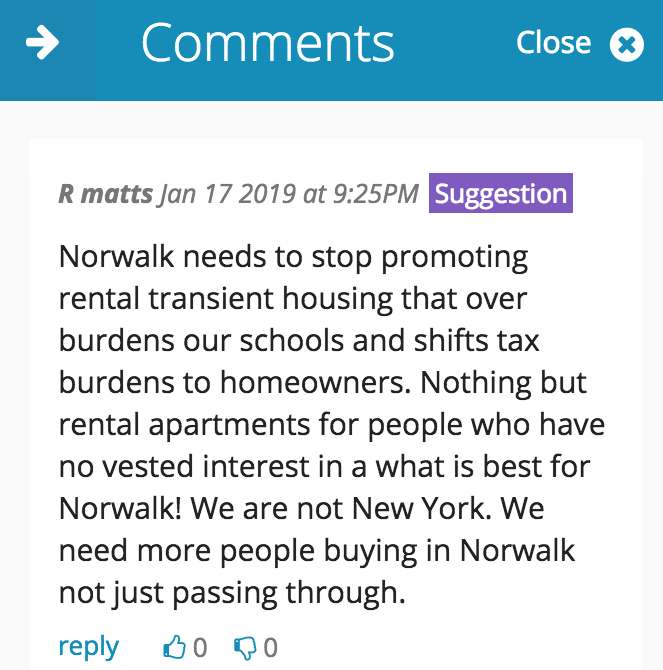 Norwalk is getting too overcrowded and city government continues to approve more and more apartment buildings without thought to the future of Norwalk. I go to the meetings and hear people say enough already, why don’t you hear it in city hall or do you just not care? Enough already for the 1000th time. Open space and smrat development so we can breath a little. Wouldn’t that be a change. Along with a bookstore, how about a blacksmith? And a typewriter repair shop? Amen to both comments above!! Smart city development?? – there are plenty of advisors who know this stuff – thru thoughtful development elsewhere up the coast – and they are willing to partner and collaborate – we can also seek regional/nat’l organizations’ help – they link these experts who could take a closer analysis of our niche city. We are indeed niche, unique – we do NOT want to become a Stamford nor are we suited for a Mini-Manhattan scale development – if we continue to pursue either, we’ll sacrifice the very advantages we have as a community, a destination and investment for home owners, innovative business = tax payers. We need to be more like Stamford, and less like Bridgeport. Have you seen Stamford’s beautiful skyline filled with tons of major businesses? And they keep expanding and making it desirable for more people/workers to live there. Stamford is moving FORWARD…companies (and people) WANT to move there. Norwalk is desolate. We have ZERO identity. I don’t know why you chose to identify me as a CNNA member. I spoke for myself, as myself. 1. For the City to get actively behind this project. Not lip service but action. 2. To require that least 20% of all Commissions (for P&Z, Planning, Redevelopment etc.) too have a career history in the area of commercial real estate such as development, lending or consulting followed by commercial brokerage. This is really for the overall health of the City and not just Wall Street. When you think of all the big issues the City grapples with, most are commercial real estate (land use) centered. It makes sense to have knowledgeable people on the Commissions to provide a healthy, and needed, counterpoint to the often-monolithic thinking of City Land Use Planning. There was a time when the Wall Street area was really on the down and out and could have used Redevelopment help. But not today, and not after POKO. Things have changed here. There is new excitement and revitalization happening everywhere you look. John Levin – you are truly a gem! One doesn’t have to be a rocket scientist to have concerns about City Hall’s biased overestimation of demand and revenue forecast, coupled with an underestimation of infrastructure costs. Increasingly, homeowners are expected to pick up the slack as businesses, both corporate and local (e.g. Diageo, Klaffs) leave the city. A quick property search will reveal many of our politicians and power brokers have little local property exposure. This POCD is being marketed as a Master Plan – it is not. The state mandates its update every 10 years for potential discretionary funds. As the state has no money and 60% + of our budget is funding a growing free and reduced lunch and ELL student population – less and less of the budget will be available for these grandiose plans. Biased traffic studies have been routinely underestimated and we’ve seen what happens to costs and timeline forecasts on some of our largest mega projects like: POKO, the Mall, the Walk Bridge and Washington Village. Do you trust City Hall’s POCD or your own lying’ eyes? Norwalk’s politicians have learned there are no political consequences for miscalculating ‘growth’ or lack of transparency and public control. While we talk about the POCD, the Redevelopment Agency is doing a run around, declaring large parts of the city center ‘blighted’ in order to secure employment for another 20 years. The cost/benefit ratios associated with the various ‘developments’ around town need to be subjected to professional peer reviews or benchmarked against other cities our size. A bunch of commission, council or citizen volunteers is not enough. It’s the blind leading the blind. A retailer buys merchandise, marks it up, and derives a profit. If you invest money in a physical retail bookstore, you will lose your money. If a municipality uses tax revenue to subsidize a physical retail bookstore, the municipality will lose the money. Said municipality might decide that the quaint attraction of a bookstore justifies using tax revenue to operate an insolvent retail business, but I doubt that the majority of taxpayers would favor any such proposition. Pedestrian Mobility is my agenda and “raising the bar” (perception) of Norwalk’s quality of Life – relative to our peers – namely Stamford, but also New Haven and White Plains. While we have a geographically decentralized city, the communities within: SoNo, Rowayton, East Norwalk, The Green/Wall Street, etc. – are infinitely Walkable and thus increasingly Livable and Desirable. However, we need to do more to enhance these areas and reference as examples for future development with “Complete Streets”’. Why are peripheral town centers becoming more densely populated and destination places like Bedford St (Stamford) or Main St (Westport) or Elm St (New Canaan) or Washington St (SoNo) so popular, and now so Livable ? There are both economic and social benefits to Walkable Streets – not to mention, they can also relieve congestion with well planned parking schemes and public transit. I never mentioned anything about subsidizing a bookstore or any business – I’m suggesting we invest in the physical infrastructure to facilitate human interaction. Lisa Brinton makes so many good points. 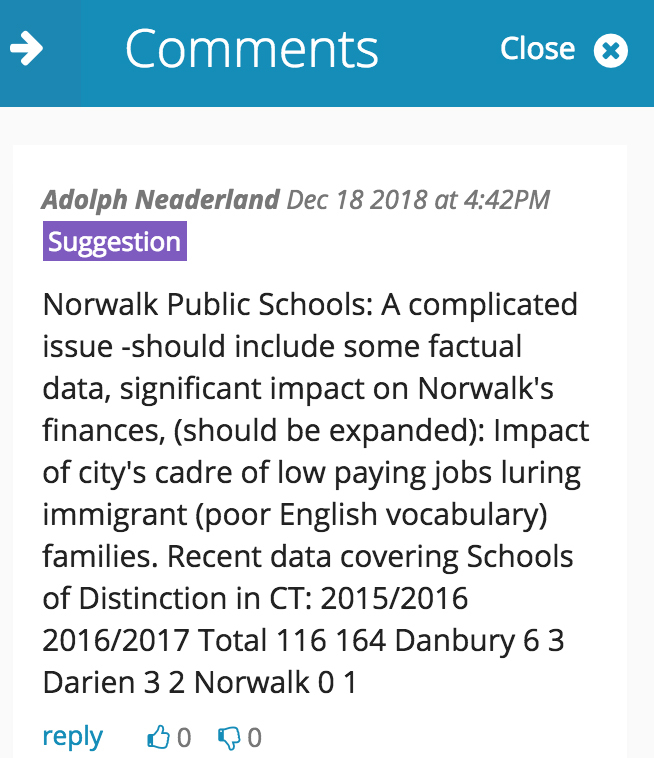 Long term expense/sustainability of overdevelopment of apartment complexes in Norwalk is as concerning as is the reality that a disproportionately large sum of taxpayer money is being allocated to NPS and to ELL students who cost 1/3 more to educate and who in many cases cannot even be tracked and verified as Norwalk residents.Traffic studies are biased, inaccurate, and in some cases not even adequately completed before new developments impacting the areas in need of study are breaking ground, cart before horse style. As a result of such disregard, residents suffer with poorly planned, sub par infrastructure. Interesting too that the RDA is all of a sudden crying blight where in the recent past they seemed to be complicit about it. That RDA is scrambling so desperately all of a sudden means that RDA is no longer relevant and therefore can afford to be abolished. Please post links to facts to back up your claims. Norwalk already has 4 train stations no need to spend millions for another one. Lets stop pandering to apartment builders and renters while making home owners pay for everything! Today at the bottom of Mill Hill where the new apartments are there is a big truck – Water Main – trying to fix something. I constantly see trucks working in that spot – one day they were going down the sewer at that same spot with sand bags. The water systems cannot handle these big apartments. Here’s a thought regarding the “bookstore” conversation that is occurring: leverage the experts that Norwalk has in place, it’s Library staff. 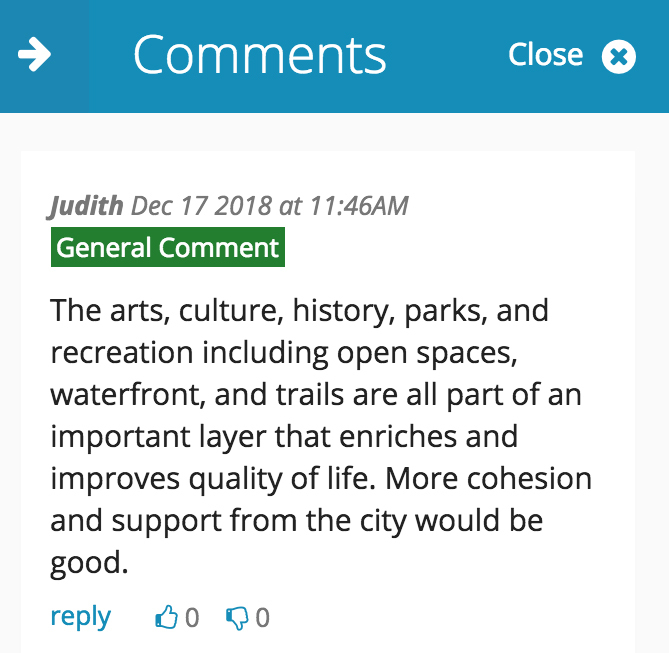 How about expanding on Brad C’s idea for “a gallery, outdoor seating, greenery, crosswalks, a bar, a coffee shop, diagonal parking, street lamps, a bicycle stand, public bathrooms, benches…” and doing that at or near the existing Library building. We have bars and restaurants on Wall St. There is an underutilized park at Wall & Belden. There is a plan in place to change the parking on Wall Street. But, best of all, there is a staff of experts in the Library who know all about books. Can they open a retail arm ? Can they host a cafe ? Could revenue from those activities enhance the Library experience ? Your comments are pretty accurate reflection of the way many people view the prospect of a Wall Street Train Station. My experience has been that when I share the facts they change their stance. Here are the facts – a train station neighborhood is usually defined as a half-mile radius around a given station. Drawing a half-mile radius around the Mechanic Street lot (ideal location for a station) the defined area is the 3rd largest train statin neighborhood in Fairfield County. It is only bested by Stamford and Bridgeport in size for overall office space, retail space and apartment units. Consider that there is not one other large downtown area in Westchester or Fairfield Counties that is not served by a train station. Regarding cost to the taxpayer – if done correctly the private sector would build this station with private sector funds. Final thought – this is the single most potent economic development tool in the books for this area. It would result in a significant increase in Grand List values for every commercial property in the half mile radius and beyond. Norwalk needs to grow its Grand List. So, why doesn’t Wall Street have a train station? You talk about Bridgeport and Stamford – neither city has 4 train stations like Norwalk. Jim McGuire (no relation) makes and excellent point. In fact that same model could be hosted in both SoNo and Wall Street. A Barnes and Noble, or other national book store (are they any left?) will not come to Wall Street for one major reason – traffic count. In fact, no major national anchor retailer will come to the Wall Street area or SoNo (outside the new Mall) because we just don’t have the traffic count. I know this as we spent 6 months canvasing for large retailers for a Wall Street space. Personally, I think that this is not a problem, but more an asset. I much prefer the mom & pop type of stores. It does pose a challenge though for the large retail spaces here but there are solutions. This might work very well with the Library which just announced its planning major changes (see related article on NoN). Subsidizing a retailer–possibly a bookstore–in SoNo? Are we serious? This is ridiculous. We already are subsidizing retailer(s) with the mall tax abatement. Not to mention various restaurant subsidies via RDA.